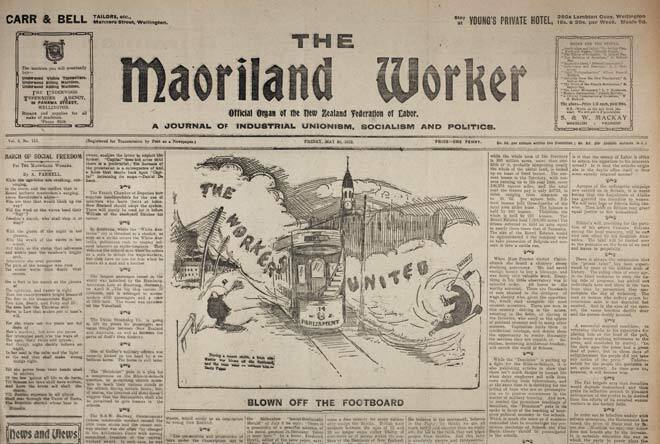 The Maoriland Worker was the newspaper of the New Zealand Federation of Labour, who were known as the 'Red Feds'. The federation, which represented the more militant trade unions, believed that the press was dominated by the employers and would never fairly report the views of the workers – so they needed their own newspaper. The Maoriland Worker was established in 1910 and in its early years was a forum for a wide range of left-wing views. In 1913 it had a weekly circulation of 10,000 copies. This cartoon on the front page of the 30 May 1913 issue suggests that the combination of the moderate and militant wings of the union movement would create an unstoppable force. The mighty gust of workers' unity blows anti-union Prime Minister William Massey off the footboard of the tram of Parliament.